Updated at 9:03 p.m. on Tuesday, March 5, 2019, to include information about prosecutors saying Hinds had 76 ounces of beer. 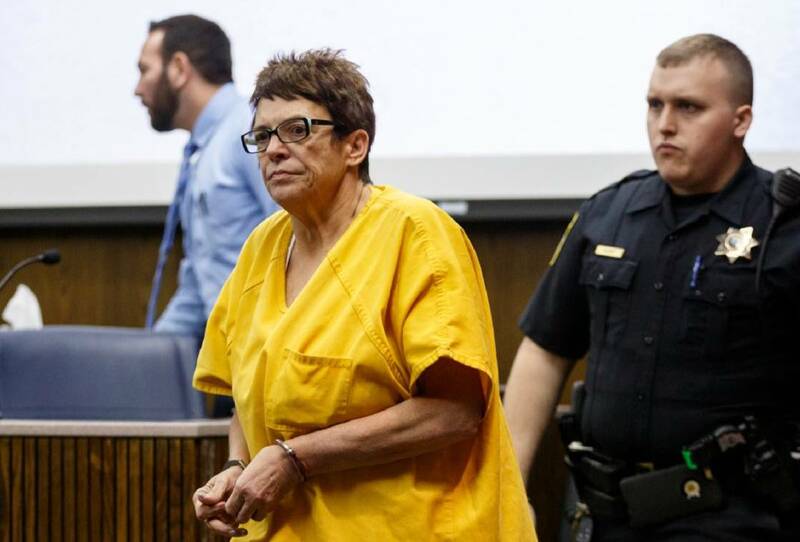 After a roughly four-hour preliminary hearing Tuesday, a judge reduced bond for 54-year-old Janet Hinds, making it possible for the Hixson woman accused of hitting and killing a Chattanooga police officer with her car to get out of custody. But that reduction may not be permanent: Hamilton County prosecutors announced they plan to seek additional impaired-driving charges against Hinds, and they spent most of Tuesday's hearing presenting evidence regarding the amount she drank the evening of the crash on Feb. 23. Friends and family of Hinds and the fallen officer, 38-year-old Nicholas Galinger, originally of Cincinnati, began gathering in the Hamilton County-Chattanooga Courts Building around 8 a.m. But there were so many of them, officials moved the hearing to a more spacious courtroom on a different floor. Even there, spectators lined the walls, watching in grim silence as prosecutors unveiled the most evidence to date in the case. Tuesday was not a trial. Rather, it was a preliminary hearing, in which General Sessions Court Judge Alex McVeagh only had to determine whether there was probable cause that a crime occurred and that Hinds likely committed it. He ruled prosecutors met that threshold, and sent Hinds' nine criminal charges to a grand jury for further review, after prosecutors argued that she had four beers, totaling 76 ounces, and a Lemon Drop vodka shot at a restaurant earlier that night, was driving an estimated 47-52 mph in a 35 mph zone on Hamill Road in Hixson and didn't appear to stop. Prosecutors recreated the last moments of Galinger's life by calling Galinger's field training officer, Jarrod Justice, to the witness stand first. Justice said he and Galinger, who had just graduated from the police academy in January, were called to inspect an overflowing manhole on Hamill Road the night of Feb. 23. After spotting it, Justice said, he walked back to the sidewalk and didn't realize Galinger had returned to the road. At the same time, Justice said, he saw headlights approaching and yelled for Galinger. But Justice, holding back tears, testified he couldn't get his attention before the car struck Galinger and sent his body flying about 160 feet. To back this up, prosecutors played footage from the training officer and Galinger's body cameras. As they flashed on the overhead, Galinger's mother and father stepped out of the courtroom while others cried in the gallery. The next witnesses described the alleged impairment. Chattanooga police Officer Jeffrey Buckner said he reviewed surveillance video from Farm to Fork, a restaurant in Ringgold, Georgia, that showed Hinds consuming four beverages over a three- to four-hour period. Chattanooga police traffic investigator Joe Warren added separately there were no hard-brake marks on the road and that Hinds wasn't fully driving in her lane. Though the state's proof provided more information about how the events unfolded, it raised more questions for Hinds' defense attorneys, Ben McGowan and Marya Schalk, about the level of their client's responsibility. McGowan argued that Hamill Road wasn't visible: A road sign over the overflowing manhole had lost its reflective cover, and the officers were dressed in navy blue. He challenged Warren's speeding estimate and said the defense would hire an expert to examine Hinds' car data for a more accurate speed and suggested Hinds was purposely driving closer to the center line to avoid rain buildup closer to the guardrail on the right. As for the alcohol consumption, McGowan pointed to a Farm to Fork server who testified Hinds didn't appear to be behaving any differently. McGowan argued that "it's just as possible she thought she hit a sign and kept going the five to 10 minutes home on a dark, rainy night." "It is hard to say any one of us would be in a position to avoid that accident," he added. "We have myriad factors that show this is a tragic and unavoidable accident." Judge McVeagh said the state showed probable cause for the charged offenses, which do not yet include any impaired driving charges like DUI. He agreed to reduce Hinds' bond for vehicular homicide from $250,000 to $100,000 after McGowan argued that his client had numerous community ties and wouldn't be an enhanced public safety risk. Judges consider those two factors very heavily as they set a bond. McVeagh reasoned that prosecutors did not dispute her community ties; they only contested that Hinds turned herself in Monday as opposed to Sunday, when officers were looking for her. But they did not present enough proof to show that she or her attorney were directly told to report sooner than Monday, McVeagh ruled. McVeagh left the bonds on her other nine charges the same, leaving her bond at $153,000 overall. Her charges are vehicular homicide, reckless driving, leaving the scene, failure to render aid, failure to report, violation of a traffic control device, speeding, failure to maintain lane and drivers to exercise due care. Next up, prosecutors will likely present her case to grand jurors in the near future.